new home in Cobb County, Traton Homes has recently announced that they are now selling beautiful homes at Great Oaks Estates in Acworth. Featuring half-acre or larger homesites, the 22 luxury new homes showcased in this serene enclave community are priced from the low-$300,000s. 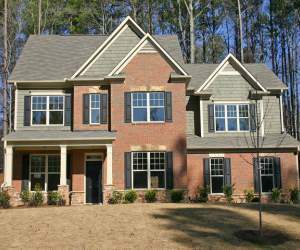 Stunning homes exude luxury with beautiful brick, cedar shake and/or stone exteriors with side-entry garages. Spacious interiors are perfect for entertaining or everyday life with upscale features that include nine foot smooth ceilings on the main level, iron balusters, finished media rooms (per plan), elegant owner’s suites with trey or vaulted ceilings, and luxurious owner’s bathrooms with large tile showers, ceramic tile floors and maple cabinetry. Gourmet kitchens are a chef’s dream with stainless steel appliances, maple cabinetry, hardwood flooring, granite countertops, and recessed lighting. Buyers that purchase at Great Oaks Estates get more than the home of their dreams, they get a prime metro Acworth location that puts residents within minutes of the excellent shopping and dining at The Avenue at West Cobb, Lakeside Marketplace and Town Center Mall. Homeowners will also enjoy the mild Georgia weather with boating, fishing, camping, hiking and more available at nearby lakes Allatoona and Acworth. In celebration of the grand opening, Traton Homes is offering a special buyer incentive on the first three homes sold at Great Oaks Estates. Buyers that purchase one of the first three homes will receive $10,000 in FREE design options plus a $2,500 closing costs bonus. See agent for details and requirements.